You are currently browsing the category archive for the ‘Humanities’ category. Being a devotee of the HBO series True Detective I became intrigued with the purported allusions to the 1895 book of short stories The King in Yellow by Richard W. Chambers. I received my copy from Amazon yesterday and read the first three stories. I have never ventured into the horror genre so this is refreshing. Chambers was reportedly influenced by Ambrose Bierce. His prose is considerably less dense than Bierce’s- closer to a 20th century cadence and vocabulary. H.P. Lovecraft took notice of Chambers as well. Lovecraft and Bierce are next on my reading list. As with the story line of True Detective, The King in Yellow (or Yellow King) is not really centered on the fictional play of the same name. Rather, it is a kind of story telling device that motivates and launches characters along the arc of another story. It’s an interesting device. For a good essay on the Alberto Gonzales mess, see The Smirking Chimp. Th’ Gaussling has been searching for a Jungian archetype representing people who are “never in doubt, but frequently wrong”. Maybe Gonzo is the man. There have been many possible nominees in the Bush II administration- POTUS, Cheney, Wolfowitz, Rumsfeld, etc. But Gonzo seems to be the most tragic of the lot. Note to future generations: I was going to further criticize POTUS, but given that he is sure to be savaged by historians, I’ll just stand clear and let experts have at it. Dammit. The three horses I bet on in the Kentucky Derby all lost. Bush II. Sphericated or Flaticular? Here along the front range of the Rocky Mountains we have a few alternative newspapers available- you know, the kind not owned by Rupert Murdoch. They tend to be a bit Bohemian and consequently are shunned by righteous Dittoheads. Other parts of the country have them as well- college towns mostly. They cater to those of us who aren’t afraid to be known as liberals. These papers run a syndicated cartoon called This Modern World by a guy known as Tom Tomorrow. Because of copyright issues, I’ll have to link to the site rather than paste an image. It has been 30 years since the release of the movie Star Wars. Back then I had just started a job at the local movie house as a projectionist. We had two Phillips-Norelco 35 mm projectors with Xenon arc lamphouses and 6000 ft reels. We’d splice 3 x 2000′ shipping reels onto one reel so that there would be fewer changeovers. The theater owner put down a $10,000 non-refundable deposit on the print and paid 90 % of the ticket sales to the distribution company for the first 6 weeks. So for the first month and a half, we made our money on popcorn, cokes, and Junior Mints. In 1977 Star Wars was THE blockbuster of all time. We had sell-out crowds every show for the first 2 weeks. The concession girls could barely keep up with the popcorn demand. Other theaters were popping corn for us in an attempt to keep up. We blew through 5 gallon syrup cylinders like spent cannon shells on a battleship in Guadalcanal. I ended up running Star Wars 186 times. But it was far from routine. The projector chewed up a bit of the end of reel three, the famous dumpster scene. Unfortunately, I was operating the night the print failed. The projector shredded about 20 feet of film (18 inches/sec) in several places and the resulting film break caused the automation to switch on the houselights, close the curtain, and start a Neil Diamond 8-track tape playing for the audience. After 3 seconds of bewilderment, the crowd turned ugly and started shouting and storming to the lobby to complain. The film stopped at a very exciting point and the customers were none too happy. I didn’t venture downstairs. The print grew progressively worse over time. The dumpster scene would chatter through the film gate in defiance of our best adjustments. But despite this, few complained when they walked out of the theater. It remains a great movie. Eventually, as a college student I moved up to a 4-plex theater with platters and automated Simplex 35’s. This night job paid for much of my BA in chemistry. I read much of Solomons Organic Chemistry in the projection booth. 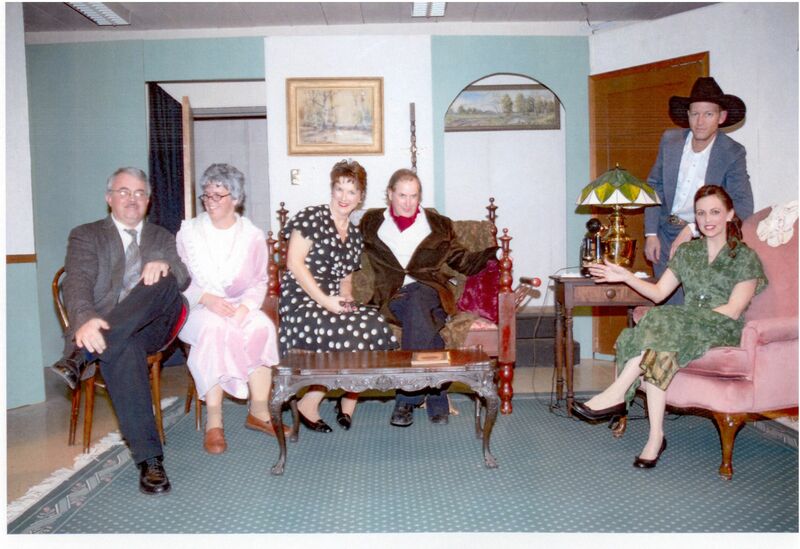 I have attached a cast picture of our recent production of The Murder Room. It turns out that there is a small number of people walking around who do several plays per year. They have no real designs on Hollywood or Broadway. They do dinner theatre or community theatre just for the pure joy of it. Despite the fact that the work is gratis, local, and not run by Spielberg or some other big name, it is nontheless a sizeable ordeal to prepare for. I am grateful that not a single bit of rotten vegetation was thrown my way and that at least some of my lines drew a smattering of laughter. I did it with a British accent somewhere between Terry Thomas and Rex Harrison. The sensation of this kind of performance was what I would imagine ballroom dancing might be like. A fluid and coordinated dance of repartee, movement, and subtext. To have performed with experienced actors was great experience and I am eager to do it again. Th’ Gaussling is in low gear this week due to extra-curricular activities. I’ve been in rehearsal since October for a play that opened last night- The Murder Room by Jack Sharkey. It’s community theatre, which is the only way a hack like myself would have had a chance. This is my first time on stage and it has been quite an experience. Acting is a lot like flying an airplane- it is exhilirating and terrifying all at the same time. And like flying, you can fall from such a height that it takes a long time to smack into the ground. Acting requires a type of learning that is rather different from learning chemistry. First, there is rote memorization. There is no escape from knowing your lines. With experience the actor can develop the character around the structure of the dialog. It is nowhere near as easy as it looks, and it does require a large investment in time and effort. But in the end, performing with other actors and pulling off a complicated show is quite satisying. Christopher Walken did a great music/dance video called “Weapon of Choice” by Fatboy Slim. It is worth a look. 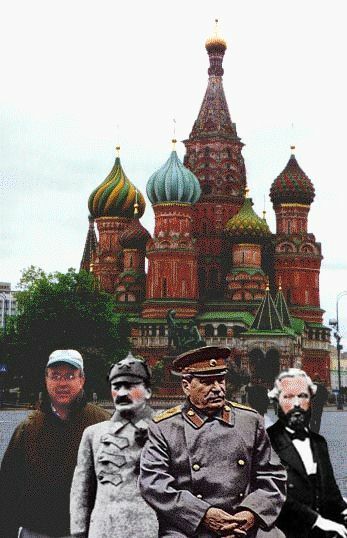 Here is a picture of a younger Gaussling with chums Leon, Joe, and Karl. Of course, Leon was never quite “right” again after his tragic incident with the ice-axe. I thought I’d disclose a picture of Th’ Gaussling for the one or two miscreants who might actually be interested. I had the opportunity to visit Blarney Castle in Ireland a few years back. The Blarney stone is said to be part of the Stone of Scone given to Cormac McCarthy by Robert the Bruce of Scotland in 1314 as a reward for support in the Battle of Bannockburn. Yada yada. It is supposed to confer the power of eloquence. I try not to think of all of the thousands of sweaty tourists that have hung backwards high in the air to kiss that clammy, dank stone. Yeah, I kissed it. Didn’t do a damned bit of good, though. It is easy to be lulled into the notion that the USA has reached a transcendent state of modernism; a place where people have come to adopt pluralism and tolerance. When you drive along the highways and fly the skyways of the USA, when you navigate the streets lined with familiar businesses and institutions there is this comforting though superficial vibe that you are in an advanced culture that is fairly progressive and forward thinking. American culture has produced some of the most stunning changes in the history of life on earth. Electricity, drug design, advanced materials, aerospace, computers, semiconductors, and on and on. Yet, there is this underlying ache, a subterranean twinge out there that is disturbing in it’s potential. While I cannot accept the cosmology of supernatural beings or the physics of miracles, I have been known to attend a meeting of the Religious Society of Friends (Quakers) on a social basis. It is soothing to sit in silence and meditate in a group setting with highly civilized people like the Quakers. I remember some years ago at a Friends Meeting in Boulder, CO, listening to Kenneth Boulding (now deceased) make a comment during the meeting. It was in another context, but the thrust of it is relevant nonetheless. He pointed out that a few miles below the serenity of the nearby mountains there exists magma that, if given the chance, will flow to the surface and erupt. He observed that below the surface people also have raw and violent forces that sometimes escape. His point was more of a lyrical acceptance of this human frailty than one of condemnation. Examples of this condition are too numerous to count. I was reminded of this comment of Boulding when I encountered some commentary on a recent editorial from the Wall Street Journal. I can’t afford to subscribe to the WJS- I found it in the popular blog Pharyngula. The author of this exceptional blog has added commentary and I won’t spoil it for the reader. It is worth linking over there to read it. Beneath the surface of consciousness of many, many people is the need to strike out at those have a different view of things. Few points of view will evoke as vigorous a negative response as atheism does from believers in the Big 3 religions that originated in the middle east. To these people, atheism is a kind of poke in the eye. The very presence of atheism seems to be a kind of pestilence or a corrosive influence on society itself. Believers in a supernatural being are convinced that without a diety, there can be no moral frame of reference. It is much like the number line with its positive numbers, it’s negative numbers, and, importantly, zero. To theists, God is the zero of the moral number line. It represents the demarcation of the positive and the negative realms. As the theists would assert, without a frame of reference anchored from a higher plane, man is hopelessly absent a moral compass. One thing is certain. I’m not going to solve this matter tonight. I do know that civilization is one millimeter thick and there are plenty of places on earth where it has worn off to reveal the troubled underlayment of our species. This week, in the land of Nebukanezzar and the gardens of Babylon, many good people have died for no good reason.